Objective: The objective of this study was to apply the newly recommended mandatory immunohistochemical (IHC) markers, isocitrate dehydrogenase (IDH) and ATRX, in addition to our previously applied panel of p53, epidermal growth factor receptor [EGFR], vascular endothelial growth factor [VEGF], MDM2, and Ki67 on histopathologically diagnosed thirty cases of glioblastoma. Their interrelationship and correlation with survival pattern were analyzed. Materials and Methods: A retrospective analysis of the histopathology records and clinical case files was done in thirty cases of glioblastoma (World Health Organization Grade IV). These cases were analyzed for certain defined clinical and histopathological parameters. IHC staining for IDH1-R132H and ATRX was done. IHC scores for p53, EGFR, VEGF, MDM2, and Ki67 were included from the previously published dataset. IHC labeling of all these markers was analyzed, and their interrelationship was studied and correlated with the survival pattern. Results: Cases were categorized as glioblastoma, IDH-wild type; glioblastoma, IDH-mutant; and glioblastoma, not otherwise specified (NOS). A total of 17 cases were categorized as glioblastoma, IDH-wild type and 10 cases were categorized as glioblastoma, IDH-mutant. Three cases in younger adults were categorized as glioblastoma, NOS. In glioblastoma, IDH-wild type, p53 expression was found in 7 cases, increased Ki67 expression was present in 12 cases, VEGF expression was found in 16 cases, MDM2 was expressed in 14 cases, while EGFR expression was present in 10 cases. 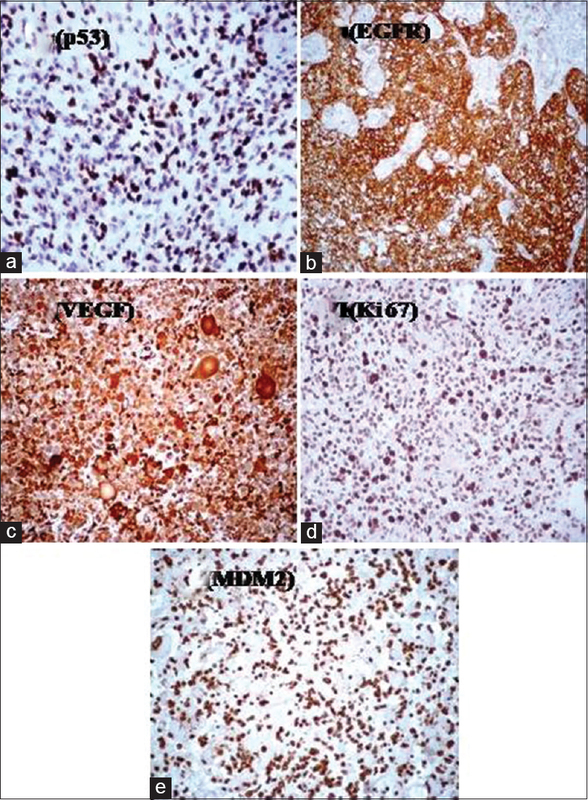 In glioblastoma, IDH-mutant, p53 expression was found in 5 cases, increased Ki67 expression was present in 4 cases, VEGF expression was found in 9 cases, MDM2 was expressed in 5 cases, while EGFR expression was present in 3 cases. The mean overall survival in glioblastoma, IDH-wild type was 3.1 months and, in glioblastoma, IDH-mutant, the mean overall survival was 6.4 months. Conclusion: Survival pattern of glioblastoma, IDH-mutant, was better than glioblastoma, IDH-wild type. Glioblastoma and its variants correspond histologically to the World Health Organization (WHO) Grade IV. Glioblastoma accounts for 15% of all the primary brain tumors, with a median survival range of 1.5–2 years. Classification of brain tumors for the past century has been based largely on the concepts of histogenesis; however, recently the 2016 WHO Classification of Tumours of the Central nervous System (2016) has incorporated the well-established molecular parameters in addition to the existing light microscopic appearance, immunohistochemical (IHC) expression of proteins, and the electron microscopic assessment of ultrastructural features. In this new classification, glioblastoma has been classified into three categories as follows: glioblastoma, IDH-wildtype; glioblastoma, IDH-mutant; and glioblastoma, not otherwise specified (NOS). Among the three, glioblastoma, IDH-wildtype, shows typical diffuse growth pattern, featuring nuclear atypia, cellular pleomorphism, mitotic activity, microvascular proliferation, and/or necrosis, and it lacks mutations in the IDH genes. IDH-wildtype glioblastoma is the most common, accounting for about 90% of all glioblastomas, typically affecting adults with a mean age at diagnosis of 62 years with a male-to-female ratio of about 1.35:1. It typically arises de novo. Glioblastoma, IDH-mutant, shows typical diffuse growth pattern, featuring nuclear atypia, cellular pleomorphism, mitotic activity, microvascular proliferation, and/or necrosis, with a mutation in the IDH 1 or IDH 2 gene. IDH-mutant glioblastomas account for about 10% of all glioblastomas, which manifest in younger adults with a mean age at diagnosis of 45 years. They typically develop through malignant progression from diffuse or anaplastic astrocytoma. Glioblastoma, NOS, is defined as a high-grade glioma with predominant astrocytic differentiation, featuring nuclear atypia, cellular pleomorphism, mitotic activity, and typically a diffuse growth pattern with microvascular proliferation and/or necrosis, in which IDH mutation status has not been fully assessed. In our previous study published in an earlier volume of this journal, the clinical and histopathological features in thirty cases of glioblastoma were correlated with IHC parameters (p53, epidermal growth factor receptor [EGFR], vascular endothelial growth factor [VEGF], MDM2, Ki67) and patients' survival statistics. With the introduction of certain mandatory IHC markers in the workup of astrocytic neoplasms in the “WHO Classification of Tumours of the Central Nervous System (2016),” an attempt was made to extend this study and additionally apply IDH and ATRX on the same dataset. The objective of this study was to elicit and analyze any further stratification of histopathological and survival parameters after additionally applying the newly recommended IHC markers, IDH and ATRX, to the previously applied panel. A retrospective analysis of the histopathology records and clinical case files was done in thirty cases of glioblastoma (WHO Grade IV) received at our department over a period of 5 years. These cases were analyzed for certain defined clinical and histopathological parameters with some relevant IHC parameters. Clinical parameters included age, gender, clinical features such as signs and symptoms at onset, duration of symptoms, localization of tumor, treatment modalities, and role of adjuvant therapy. Histopathological parameters included extent of necrosis, pattern of microvascular proliferation, mitotic activity, and presence of other components or variants (including oligodendroglial component, gemistocytic component, and giant cell variant). IHC parameters included IDH 1-R132H and ATRX expression, expression of p53, EGFR, VEGF, Ki67, and MDM2. Cytoplasmic expression of IDH 1-R132H and nuclear expression/loss of ATRX were used to categorize the cases into glioblastoma-IDH wild type (ATRX nuclear expression retained) and glioblastoma IDH-mutant (loss of nuclear ATRX expression). The score was calculated as a percentage of positively labeled nuclei. Overall, 1000 tumor cells were counted in randomized fields throughout the section. The expression for all IHC markers was evaluated quantitatively as the percentage of positive tumor cells over total tumor cells. A cutoff of ≥30% positivity was labeled as positive, while <30% was labeled as negative for IDH1-R132H and ATRX. IHC scores for p53, EGFR, VEGF, MDM2, and Ki67 were included from the previously published dataset. Unpaired t-test, Chi-square test, Fisher's exact test, and Mann–Whitney test were applied to calculate the mean age of presentation in glioblastoma-IDH wild type and glioblastoma IDH-mutant and to analyze the other clinical parameters in both categories, to correlate the histopathological parameters with survival in both categories, to assess the expression of IDH1-R132H, ATRX, p53, EGFR, VEGF, Ki67, and MDM2 in glioblastoma-IDH wild type and glioblastoma IDH-mutant, and to assess the mean survival in glioblastoma-IDH wild type and glioblastoma IDH-mutant. Based on IDH1 status assessed by immunohistochemistry, the cases were categorized as glioblastoma, IDH-wild type; glioblastoma, IDH-mutant; and glioblastoma, NOS. 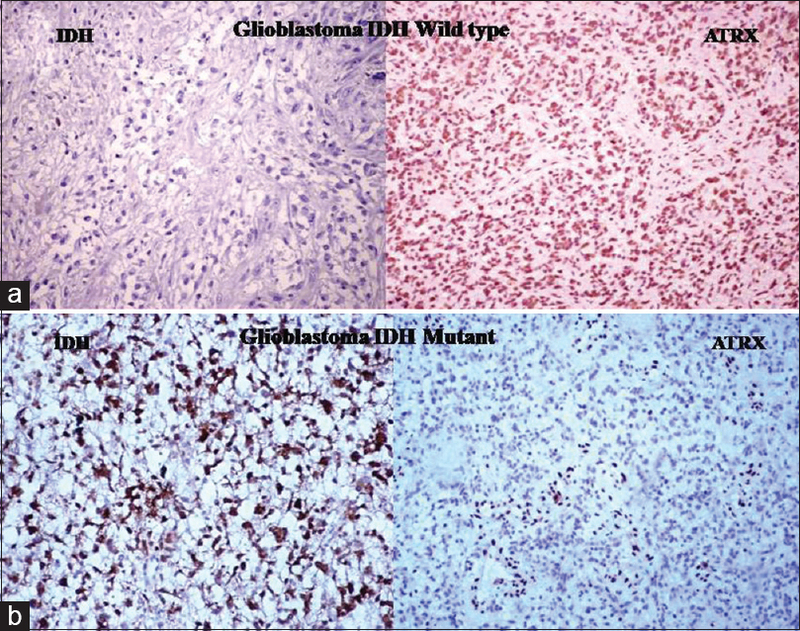 Glioblastoma, IDH-wild type, showed immunonegativity for IDH-1, while glioblastoma, IDH-mutant, showed immunopositivity for it; regarding ATRX, nuclear positivity was seen in glioblastoma, IDH-wild type, and loss of nuclear expression was seen in glioblastoma, IDH-mutant [Figure 1]. Based on these, 17 cases were categorized as glioblastoma, IDH-wild type, and 10 cases were categorized as glioblastoma, IDH-mutant. Three cases in younger adults were categorized as glioblastoma, NOS. The younger adults were categorized as glioblastoma, NOS, because as per the WHO 2016 criterion, the definition of full IDH evaluation differs for glioblastomas in older patients compared to glioblastomas in younger adults. In the latter situations, IDH sequencing is highly recommended following negative R132H IDH1 immunohistochemistry, whereas the near absence of R132H IDH1 and IDH2 mutations in glioblastomas from patients aged above 55 years suggests that sequencing may not be needed in the setting of negative R132H IDH1 immunohistochemistry in such patients. The mean age of presentation was 60 years in glioblastoma, IDH-wild type. There was a male preponderance with a male:female ratio of 1.4:1. There was a wide range in the duration of symptoms, with a mean duration of 2.8 months. The predominant clinical features included focal neurological deficits including hemiparesis and aphasia. Overall, glioblastoma IDH-wild type showed a widespread anatomical distribution. Among the cases of glioblastoma, IDH-mutant, the mean age of presentation was 41.2 years. There was a male preponderance with a male:female ratio of 2.3: 1. There was a wide range in the duration of symptoms, with a mean duration of 2.5 months. The predominant clinical features included signs and symptoms of raised intracranial tension. Overall, glioblastoma, IDH-mutant, showed a predominant involvement of the frontal lobe [Table 1]. All the patients underwent surgery; a near-total/gross total resection was achieved in 17 cases (56.7%). The remaining 13 cases (43.3%) had a subtotal resection. Of the 30 cases, large areas of necrosis (>50%) was seen in 7 (23.3%) cases, while the remaining 23 cases (76.7%) showed relatively less necrosis (<50%). Microvascular proliferation showing both endothelial cell proliferation and glomeruloid tufts was seen in 19 (63.3%) cases, while in 11 cases (36.7%), only endothelial cell proliferation was observed. Twenty-four cases (80%) had mitotic count ≤5/high-power field (HPF), while 6 cases (20%) had mitotic count ≥5/HPF. In this study, additional features including multinucleated giant cells were seen in three cases, while oligodendroglial and gemistocytic components were present in 12 cases [Figure 2]. None of the histopathological parameters showed any correlation with survival. Of the 17 cases of glioblastoma-IDH wild type, all 17 cases showed immunonegativity for IDH 1 with preserved nuclear expression of ATRX. Seven (41.2%) cases showed immunopositivity for p53. Ten (58.8%) cases showed overexpression of EGFR by immunohistochemistry. Sixteen cases (94.1%) showed overexpression of VEGF. Ki67 showed overexpression in 12 cases (70.6%). MDM2 was expressed in 14 cases (82.4%). Among the ten cases of glioblastoma-IDH mutant, all cases showed cytoplasmic immunopositivity for IDH 1 with loss of nuclear expression of ATRX. Five (50%) cases showed immunopositivity for p53. Three (30%) cases showed overexpression of EGFR. Nine cases (90%) showed overexpression of VEGF. Ki67 showed overexpression in four cases (40%). MDM2 was expressed in five cases (50%) [Table 2] and [Figure 3]a, [Figure 3]b, [Figure 3]c, [Figure 3]d, [Figure 3]e.
Mean survival in glioblastoma-IDH wild type was 3.1 months, while survival in glioblastoma-IDH mutant was 6.4 months. Glioblastoma is the most frequent malignant brain tumor in adults, accounting for approximately 15% of all intracranial neoplasms and approximately 45%–50% of all primary malignant brain tumors. Recently, the 2016 WHO classification has incorporated certain key molecular parameters (IDH and ATRX) into the classification of glioblastomas. Mutations of the IDH 1 and IDH 2 genes which encode IDH 1 and IDH 2 have been found in nearly all glioblastomas that have progressed from astrocytomas (clinicopathologically defined secondary glioblastomas) but are exceptional in primary glioblastomas. Thus, IDH 1 mutations (assessed by immunohistochemistry/sequencing) constitute a reliable molecular signature of IDH-mutant glioblastomas that may be synonymous with the secondary glioblastomas. Similarly, ATRX mutations are observed in about 60%–70% of IDH-mutant glioblastomas and in about 30% of pediatric glioblastomas. These molecular subtypes do play a very important role in the clinical practice as the treatment strategies are now being planned in accordance to the molecular subtype. In addition, introduction of these mandatory IHC markers (IDH and ATRX) also provides an increased level of objectivity. The WHO 2016 classification has, to a large extent, streamlined the application of IHC and molecular diagnostic tools; still the previous markers are in use as per the availability of resources and ease of application. It needs to be analyzed that how these markers fare vis-a-vis the newly recommended ones. Do they still have any role or should they be done away altogether? This study, though on a very small number of cases, sought to address this issue. In this study, based on IDH and ATRX status, the glioblastomas were categorized as glioblastoma IDH-wild type and glioblastoma IDH-mutant. The mean age of presentation in IDH-wild type was 60 years, while in IDH-mutant, it was 41.2 years, showing concordance to the existing literature and the other studies that had assessed IDH-1 and ATRX in glioblastomas.,,, Regarding localization, glioblastoma IDH-wild type showed a widespread anatomical distribution, mostly supratentorial, while glioblastoma IDH-mutant was predominantly frontal in location, in concordance to the WHO criterion and the previous studies conducted. The mean survival was better in glioblastoma IDH-mutant as compared to glioblastoma IDH-wild type. Overall, among the various clinical parameters analyzed, only age emerged as a significant prognostic factor, showing a significant correlation with patient survival (P < 0.001). In our study, none of the histopathological parameters showed any correlation with survival. Among the IHC markers, TP 53 mutations causing p53 overexpression has been reported in 81% of IDH-mutant glioblastomas, while EGFR overexpression has been reported in 35% of IDH-wild type glioblastomas. In concordance to the literature, in this study, p53 overexpression was more evident in glioblastoma IDH-mutant and EGFR positivity was reported in 58.8% of IDH wild type glioblastomas. Overexpression of MDM2 has been observed in >50% of IDH wild type glioblastomas and only in 11% of IDH-mutant glioblastomas., Our study showed MDM2 overexpression in 82.4% cases of IDH wild-type glioblastomas and 50% of IDH-mutant glioblastomas. Ki67 proliferation index shows great regional variations in glioblastomas. In this study, Ki67 proliferation index was more prominent in IDH wild type glioblastomas compared to IDH-mutant glioblastomas. VEGF expression reflecting microvascular proliferation and angiogenesis was found to be almost equivocal in IDH wild-type and IDH-mutant glioblastomas. The previously identified IHC markers, p53, EGFR, VEGF, MDM2, and Ki67, known to be significant in glioblastomas (WHO 2007) were studied along with the newly proposed markers IDH R132H and ATRX (WHO 2016). In this preliminary study, though on a very small number of cases, only IDH mutation was found to have a bearing on survival pattern, showing a better survival pattern in glioblastoma, IDH-mutant than glioblastoma, IDH-wild type. The remaining markers, though contributory diagnostic markers, cannot be taken as independent prognostic markers. Liu N, Wang PF, Song HW, Kong LW, Yao K, Qi XL, et al. Immunostaining of IDH-1 R132H and ATRX proteins in the classification of adult glioblastomas. Int J Clin Exp Pathol 2016;9:12849-54. Pant I, Jha DK, Gautam VK, Tripathi CB, Chaturvedi S. Epidermal growth factor receptor, vascular endothelial growth factor, mouse double minute 2 homolog, Ki 67, and p53 expression in glioblastoma: A survival analysis including the prognostic value of clinical, histopathological and immunohistochemical parameters. Int J Clinicopathol Correl 2017;1:35-40. Jiao Y, Killela PJ, Reitman ZJ, Rasheed AB, Heaphy CM, de Wilde RF, et al. Frequent ATRX, CIC, FUBP1 and IDH1 mutations refine the classification of malignant gliomas. Oncotarget 2012;3:709-22. Reuss DE, Sahm F, Schrimpf D, Wiestler B, Capper D, Koelsche C, et al. ATRX and IDH1-R132H immunohistochemistry with subsequent copy number analysis and IDH sequencing as a basis for an “integrated” diagnostic approach for adult astrocytoma, oligodendroglioma and glioblastoma. Acta Neuropathol 2015;129:133-46. Wang PF, Liu N, Song HW, Yao K, Jiang T, Li SW, et al. IDH-1R132H mutation status in diffuse glioma patients: Implications for classification. Oncotarget 2016;7:31393-400. Ikemura M, Shibahara J, Mukasa A, Takayanagi S, Aihara K, Saito N, et al. Utility of ATRX immunohistochemistry in diagnosis of adult diffuse gliomas. Histopathology 2016;69:260-7. Liu XY, Gerges N, Korshunov A, Sabha N, Khuong-Quang DA, Fontebasso AM, et al. Frequent ATRX mutations and loss of expression in adult diffuse astrocytic tumors carrying IDH1/IDH2 and TP53 mutations. Acta Neuropathol 2012;124:615-25. Chaurasia A, Park SH, Seo JW, Park CK. Immunohistochemical analysis of ATRX, IDH1 and p53 in glioblastoma and their correlations with patient survival. J Korean Med Sci 2016;31:1208-14. Biernat W, Kleihues P, Yonekawa Y, Ohgaki H. Amplification and overexpression of MDM2 in primary (de novo) glioblastomas. J Neuropathol Exp Neurol 1997;56:180-5.